When we’d first heard about skiing in Antarctica, it sounded a little bizarre. We’d conjured up thoughts of Antarctica being a flat icy mass and the only option being cross country skiing. 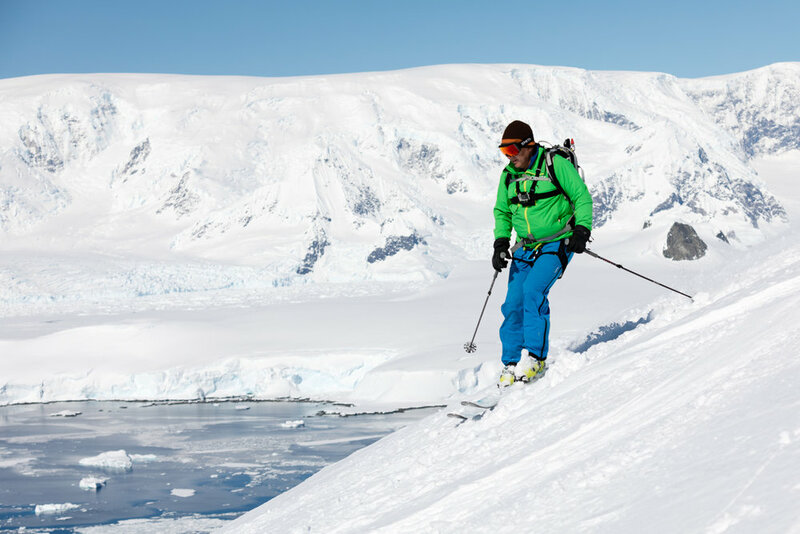 After seeing some photos of skiing on the Antarctic Peninsula, we quickly realised the white continent is incredibly mountainous, offering endless ski touring opportunities. And after seeing some photos of the penguins and the extraordinary beauty and magnificent rawness, we quickly added an Antarctic ski trip with Ice Axe Expeditions to our bucket list! Getting to Antarctica required some pretty serious commitment, and not just financially. It took 32 hours to fly to Ushuaia in Argentina, the most southern city in the world nicknamed “the end of the world”. We spent a few days in Ushuaia to get our heads in the right time zone and to do some warm up ski touring on the Martial Glacier just above town. We boarded the Ocean Adventurer, a reasonably small cruise ship with plenty of creature comforts, which was our home for the 10 day cruise. 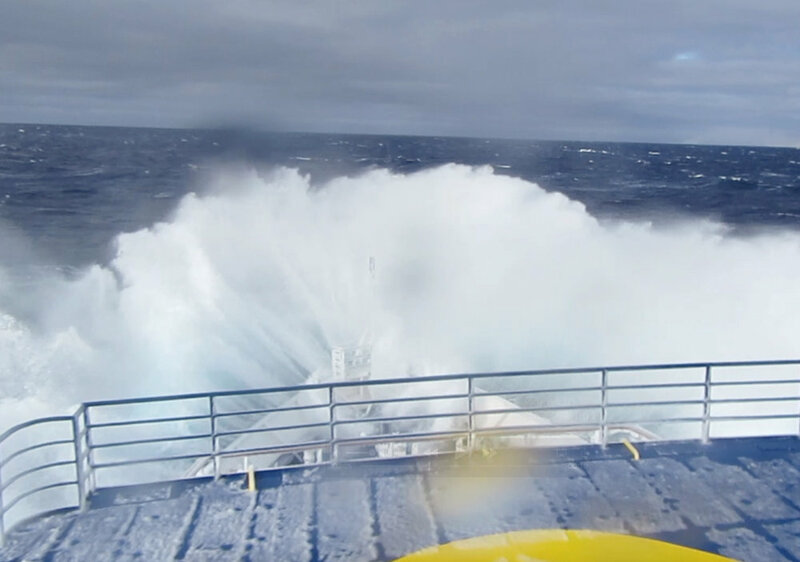 Well it definitely wasn’t a “cruise” initially as we crossed the Drake Passage, the body of water between the notorious Cape Horn and Antarctica, which is renowned for frequent rough seas. When many sick bags suddenly appeared in the boat corridors, we knew we were in for a wild ride! Thank goodness for seasickness tablets, because whilst we didn’t get the full “Drake Shake”, it got pretty stormy and one night the winds were 60 knots gusting up to 90 knots (170km/hr)! When we first saw the splendour of the 7th continent after two days at sea, all was forgotten. What rough seas?! The skiing was only one part of the attraction of going to Antarctica, yet it was pretty special. The Antarctic Peninsula and the many surrounding islands had a seemingly infinite number of mountains and potential skiing and snowboarding lines. It was only limited by the guides being able to find possible landing zones for a zodiac to get ashore, considering the many massive ice cliffs and gigantic crevasses. Because of the heavily glaciated terrain, we were always roped up whilst ski touring. The ascents were a great chance to appreciate the amazing eye candy, and even on the grey days, the views were spectacular. The higher we skinned up, the better the vantage points to check out the views across the iceberg littered water, and the mountains themselves and the ice features were incredibly impressive. 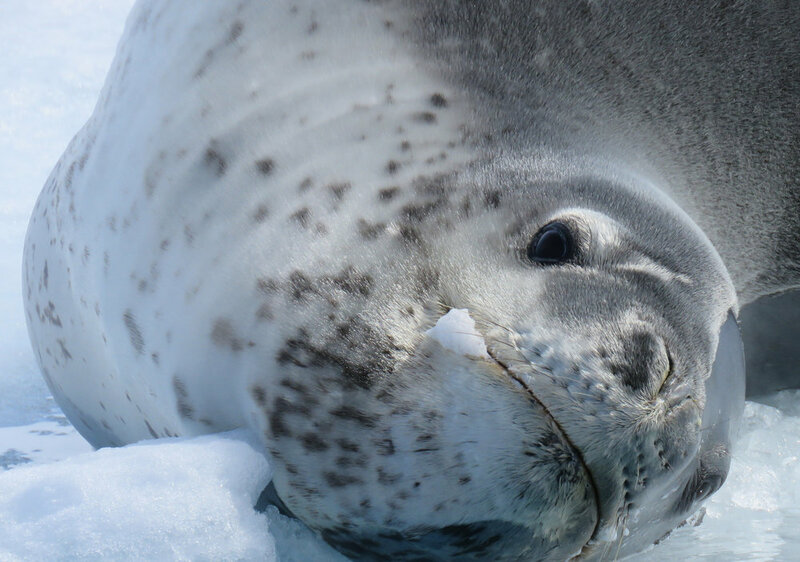 It just doesn’t get any more pure than Antarctica – the profound beauty of the untouched wilderness. It was optic nirvana! The slopes varied somewhat and included mellow ridges and steep-ish rock lined bowls. We didn’t ski anything super gnarly, in part because we don’t have technical climbing skills to get up super steep pitches. Also Antarctica is probably not the place to test your skiing prowess. There were a couple of runs where it felt like you could slide right into the icy waters if you’d fallen, and with crevasses, ice cliffs, and other hazards to avoid, it was no surprise that we listened very very carefully to every direction from our guides! As to be expected, the snow was a complete mixed bag. We skied some crust, some “polar groomers” and corn. We were even lucky enough to get a few powder runs, which is somewhat unique considering that Antarctica doesn’t receive that much precipitation. Some of the other guests were chasing max vertical, but we were keen to get the full Antarctica experience. The general routine was that we skied in the mornings, returned to the ship for a late lunch (that was incredibly decadent), and then headed out on a zodiac cruise to further appreciate the pristine landscapes and go wildlife spotting, which provided an excitement overload for us! 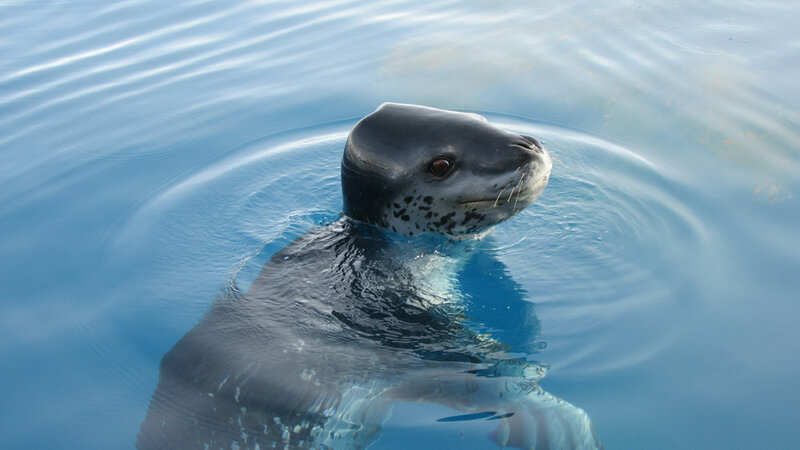 We saw plenty of seals and whales, but the highlight was when a curiously friendly leopard seal (and they’re usually not friendly!) came to frolic around our zodiac for what seemed like an eternity. Sometimes we went ashore to visit penguin rookeries and observe their funny antics! We also visited a Polish research station and checked out a whaling ship wreck. Saying that it was a “trip of a lifetime” is so cliché, but getting the opportunity to explore just a small part of the massive white continent was phenomenal. Gawking at the pristine landscapes whilst out skiing, and admiring the many penguins that adorned the shores, were experiences that we won’t forget any time soon. We’ve been fortunate enough to visit many very special places around the world, but our expectations were completely blown away. The Ice Axe Antarctica Ski Tour would definitely be the best trip we’ve ever been on! !